Get set to explore the world’s most exotic animals as they come together in an incredible life-like animatronic display at Watergardens Town Centre! On the 23rd of March, Watergardens welcomed this amazing exhibition which will feature the world’s most exotic animals and will allow visitors to immerse themselves in the wonderful world of wildlife. The display, which will feature lions, tigers, zebras, macaws and, gorillas, to name just a few, is a fun-filled way for children and adults to learn more about these intriguing animals. Visitors will have the opportunity to get close to a zebra’s stripes, hear a lion roar, spot a giraffe standing tall, see the sparkle in a tiger’s eye, and listen to the calls of macaws and much more. THIS IS THE FIRST TIME THIS EXHIBITION WILL BE ON DISPLAY IN AUSTRALIA! In addition to the animatronic display, Watergardens Town Centre will host an animal craft workshop, where children can let their creative side go wild, and make their own animal mask to take home. There will also be an animal cookie decorating workshop, as well as an opportunity to take a photo up close and personal with a panda. Pegged as a must-see event these school holidays, the animal display is open from the 23rd March until Sunday 19th April 2015. It is set to deliver a lifelike animatronic show that will capture the beauty of wildlife. A FREE spectacular animal animatronic display. FREE Animal craft workshops, where children can create their own animal mask. Opportunity to take home a Photo Souvenir with a life like panda in our wildlife sanctuary photo station. FREE adventure map activity for children. 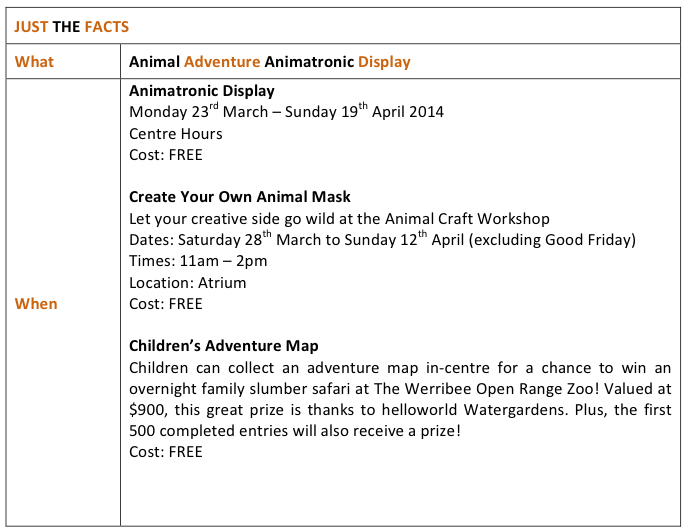 The opportunity to win a family slumber safari at The Werribee Open Range Zoo. 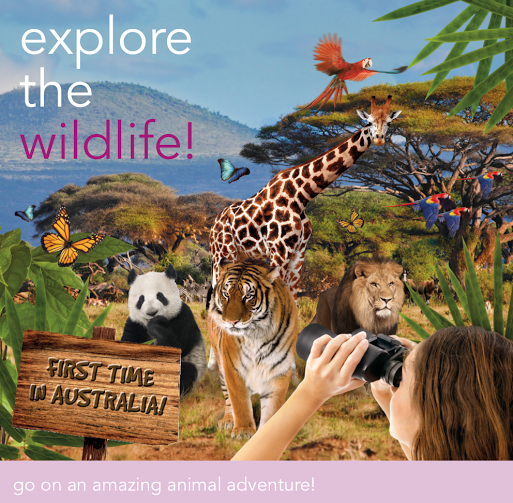 NJT Blogger is giving away an animal pack valued at $100 to celebrate the opening of Explore the Wildlife exhibition at Watergardens Town Centre. Giveaway ends: Monday 6th of April at midnight. Winners will be drawn: Tuesday 7th of April. **Media release gift pack received in exchange for promotion of this giveaway and post here. My daughter loves the giraffe, how tall and lanky they are! My daughter loves elephants, I hope one day that she can see a real one! My daughter loves elephants and foxes. My boy loves elephants as well. my 3 year old daughter loves koalas and my 2 year old son loves tigers! And seeing their long tongues as they chew!!! Gorillas and Chimps are a big hit here, and we are all very excited about the new baby in the zoo. Thanks to the loveable movie Paddington bears have become our favourite animal! My daughters absolutely love Koalas! They enjoy reading about them, watching programmes about them, and visiting animal sanctuaries. They are amazed to know that koalas sleep for eighteen to twenty-two hours! They are also intrigued that The word “koala” means “no drink” in an Aboriginal language. My daughters would definately be over the moon to have this opportunity to explore the Wildlife at WaterGardens. Our favorite animal is the Elephant it is so gracious as it walks even though it is a giant animal compared to some of the others. Pink Flamingo's are little Hayden's favourite he always likes watching them at the zoo. Ever since learning about them at school, Katie loves pygmy possums. The "Panda Bears" she says they are so cuddly and she just wants to go and hig them. We love red pandas and giraffes! They love the koala's, they want one but I have to keep reminding them why they are called a bear!! Bonobos (pygmy chimpanzee) they run around pretending to be them but I love them because they share 98.5% of the same DNA as humans and embody a profound intelligence, deep emotional capacity and are non-aggressive making love not war! My daughter is a huge fan of Zebras, to her they are just one step away from being unicorns. Sharks are a clear-CUT winner! They deserve PREYS, show GUTSY performances, and are very FINteresting, I make no BONES about it, they're absolutely JAWsome!